Inspired by my two sisters who are working on Grandmother’s Flower Garden quilts, I decided to give English paper piecing a whirl. 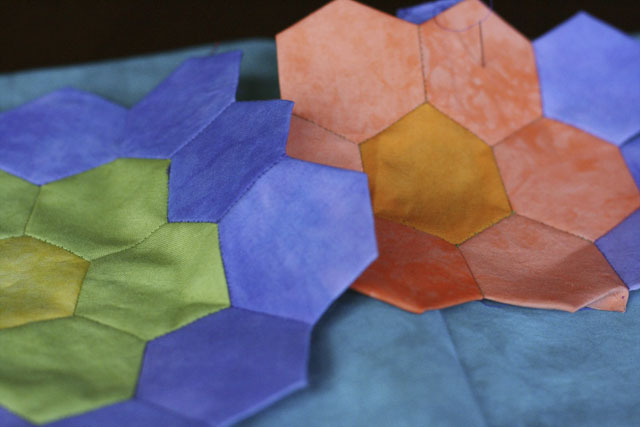 The little hexagons makes a great take-along project. The pieces are small and all the supplies can fit into a purse-sized tin. I decided to put my spin on this classic by stitching it in bright hand-dyed fabrics. Unfortunately, I typically use a very tightly woven fabric for my hand-dyes. The tight weave takes the dye very well and the colors are very vivid. However, the tight weave means it is more difficult to hand stitch. I haven’t dyed fabric in a while…now I have my excuse! Oh my goodness. I am right there with you. Learning to EPP. I cannot get enough of it! I am using 1930’s fabric and am looking for a good yellow to make the centers. I love it! 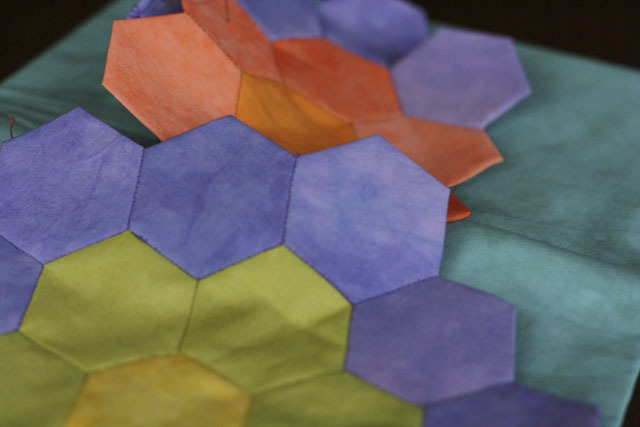 I like your hexagon project very much. Even though it is a grandmother’s flower garden, and I’m not so sure about doing that with hexagons, I just love how the colors flow together. I have a funny feeling I’m to love your finished quilt. It may take a while–be patient! !/4 inch—YIKES! You must have very good fine motor skills and a great deal of patience. I think you should make it a queen size quilt!? These are beautiful! Love the solid colors…I never thought to do it like that.